Exported clunkers to Mexico replace still older cars, yielding environmental benefits. Does Exporting Vehicles Export Pollution? International trade in used vehicles between rich and poor countries functions as an informal “cash for clunkers” program: rich countries send used cars to poor countries, and poor countries send cash to rich countries. This trade has enormous implications for the mobility of people in developing countries, but it also has environmental consequences. Vehicles emit many local and global pollutants, and they are also a major source of carbon dioxide, the principal greenhouse gas associated with climate change. Older vehicles tend to be substantially dirtier than new ones, and people in poor countries tend to hold onto vehicles for longer than their counterparts in rich countries. As a result of the international trade in used vehicles, a car that is “retired” in the US or Japan can actually be driven for many years afterward in Mexico, Senegal, or another poor country. What are the environmental results of the international trade in used vehicles? 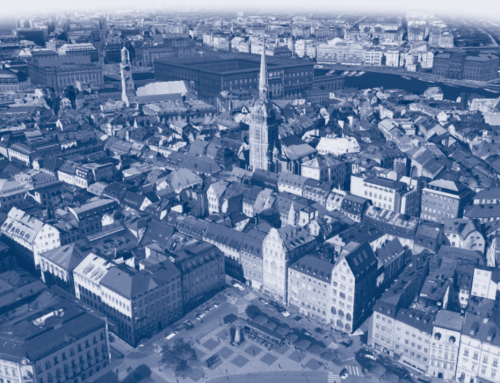 One possibility is represented by the “pollution havens” hypothesis, which says that trade liberalization will cause pollution to move to countries with lower environmental standards. If this hypothesis has merit, we should see heavily polluting vehicles being sent from rich countries to poor countries. However, even if poorer countries become pollution havens, it does not automatically follow that trade makes pollution in the poor countries worse. What matters is not whether rich countries export heavily polluting cars to poor countries, but whether those cars pollute more than the cars already in poor countries. A vehicle too dirty to pass environmental muster in a developed nation might nevertheless be cleaner than the average vehicle in a less developed nation, meaning that a poor country might become a pollution haven yet simultaneously see the cleanliness of its vehicle fleet rise. Further, if the used cars exported from rich countries are replaced by newer, cleaner cars—as they most likely are—then trade could result in cleaner vehicle fleets in both the exporting and the importing nations. What matters is not whether rich countries export heavily polluting cars to poor countries, but whether those cars pollute more than the cars already in poor countries. But this happy conclusion depends on two factors: the length of time the exported vehicle stays on the road once it is in a poor country, and whether it replaces, rather than adds to, the vehicles in the existing poor-country fleet. A vehicle that is cleaner than average when it is imported will over time get dirtier, and if that vehicle is an addition to rather than a replacement for vehicles already in the poor country fleet, then overall emissions in that country could rise. So what does happen as a result of this international trade? 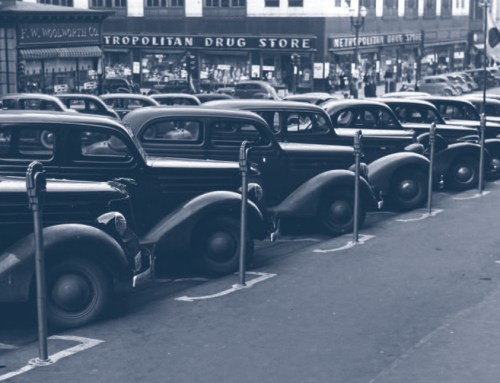 Because many factors influence the composition of a nation’s vehicle fleet, it can be difficult to isolate the impact of the trade in used vehicles. The task is further complicated by the relative absence of detailed data on vehicles that flow across international borders. For example, the World Trade Organization tracks “automobile products,” but doesn’t distinguish between new and used vehicles. Media accounts suggest that the total volume of international trade in used vehicles is large, but there appear to be no comprehensive measures of this trade. Our attempt to measure the environmental impact of the trade in used vehicles circumvents these problems by examining the deregulation of US-Mexico trade in used cars and trucks following implementation of the North American Free Trade Agreement (NAFTA). Prior to 2005, Mexico prohibited the entry of virtually all used vehicles; exceptions were made for some agricultural vehicles. In August 2005, however, in accordance with the conditions of NAFTA, Mexico began allowing the import of vehicles that were between 10 and 15 years old from the United States and Canada. Virtually overnight a vigorous trade flow emerged, and between 2005 and 2008 over 2.5 million used vehicles were exported from the United States to Mexico. This represents a small fraction of the vehicle stock in the United States (about 232 million in 2005), but a substantial fraction of the vehicle stock in Mexico (about 22 million in 2005). This raw scale of imports suggests that international trade in used vehicles may have a significant effect on increasing pollution levels for the importing nation. But the actual environmental impact will depend on how much these vehicles are driven, their emissions per mile, and the transportation modes their new owners would have used in the absence of international trade. International trade in used vehicles may have a significant effect on increasing pollution levels for the importing nation. To evaluate the environmental consequences of this trade pattern, we assembled the most comprehensive dataset ever compiled on the North American trade in used vehicles and vehicle emissions. 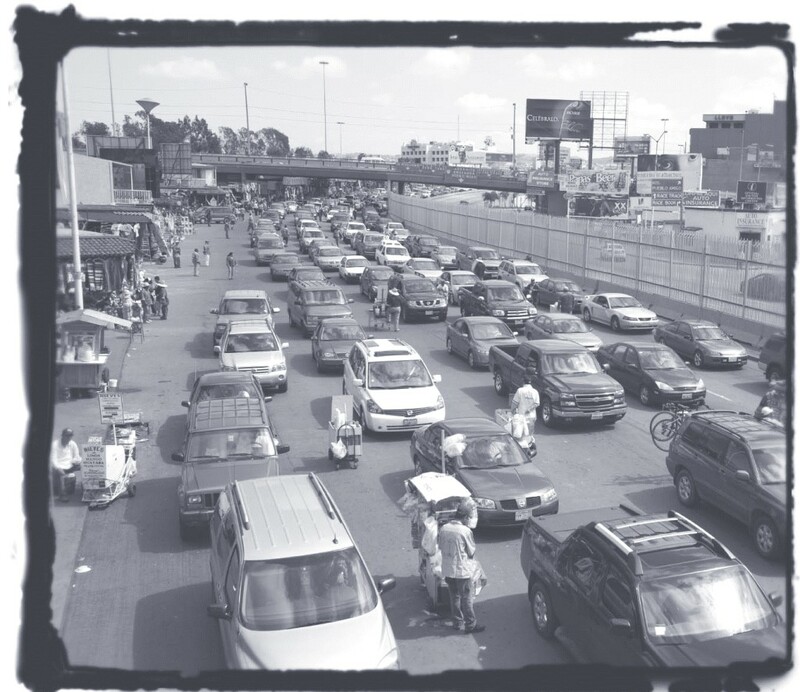 We started with a dataset collected by the Mexican Customs Agency, which describes all vehicles imported into Mexico from the US between November 2005 and July 2008. 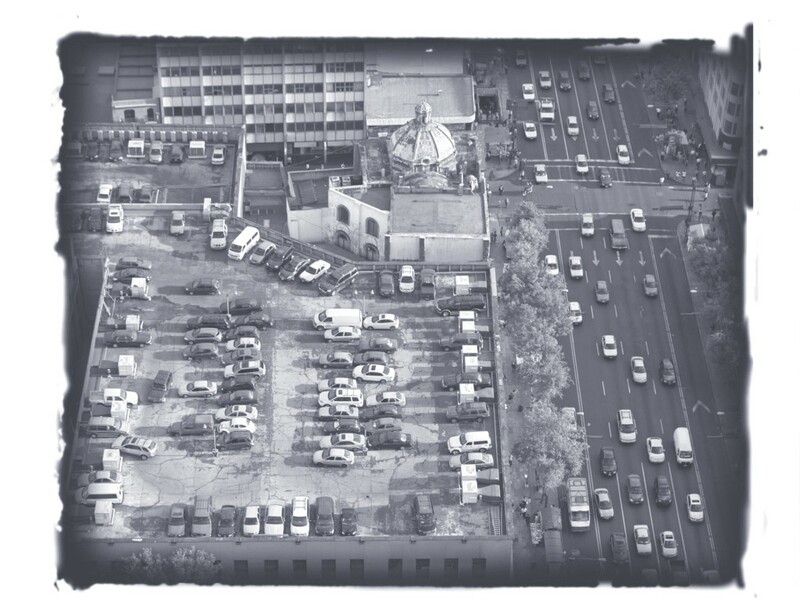 The data show only those vehicles that were legally imported and thus received Mexican license plates; vehicles that entered Mexico temporarily (i.e., with a tourist permit) do not appear in these data. Our dataset allowed us to identify, at the vehicle level (using vehicle identification numbers—VINs), which vehicles were traded. We combined these data with data on the overall vehicle fleets, by manufacturer and vintage, in the United States (from RL Polk) and in Mexico (from the Mexican Ministry of Public Safety). Finally, we merged these sources with data describing 7.2 million vehicles that were tested in 2005 under California’s Smog Check program. Figure 1 shows the monthly trade flows of used vehicles into Mexico. The first vertical line indicates the policy change in August 2005 that removed restrictions for 10- to 15-year-old vehicles. 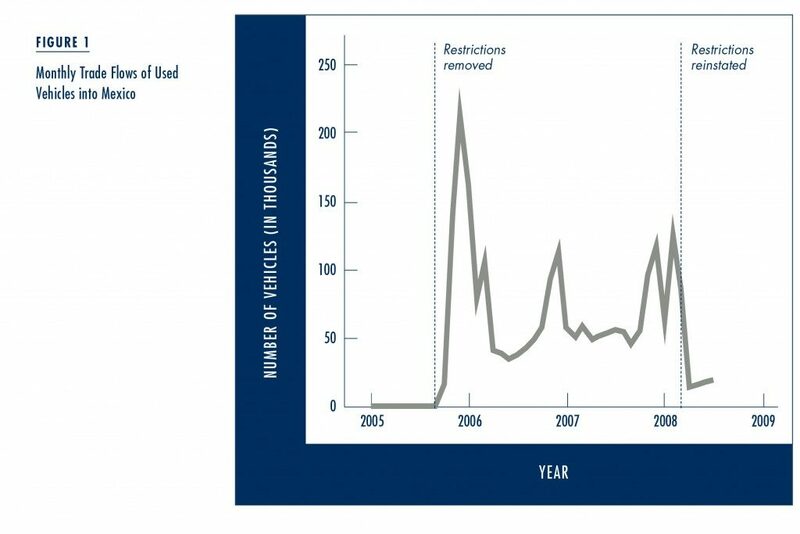 The second vertical line in March 2008 indicates the second policy change when trade restrictions were reinstated. Trade spiked at the end of 2005, reaching 225,000 vehicles in December 2005. Similar smaller spikes occurred at the end of 2006 and 2007. After March 2008 trade continued but at a considerably slower pace. Did Trade Make Mexico a Vehicle Pollution Haven? Our data allow us to examine every vehicle that was pollution-tested in California in 2005, and then, through the VIN, to identify which of these vehicles were subsequently exported to Mexico. The data therefore let us determine if vehicles that failed emissions tests were more likely to be exported. Vehicles that emit extremely high levels of pollutants are particularly detrimental to the environment; this small proportion of vehicles often contributes a large proportion of total emissions. We used a series of regression analyses to examine the probability that an exported vehicle failed emissions tests one or more times, as well as the probability that it was classified a gross polluter one or more times. (According to California law, a gross polluter is a vehicle that exceeds twice the allowable emissions for at least one pollutant.) The results show that exported vehicles are significantly more likely to be gross polluters. Even after accounting for the model and vintage, exported vehicles are 27 percent more likely to have failed emissions testing three times. Trade does seem to have made Mexico a pollution haven. Are Traded Vehicles Cleaner or Dirtier than Untraded Vehicles? 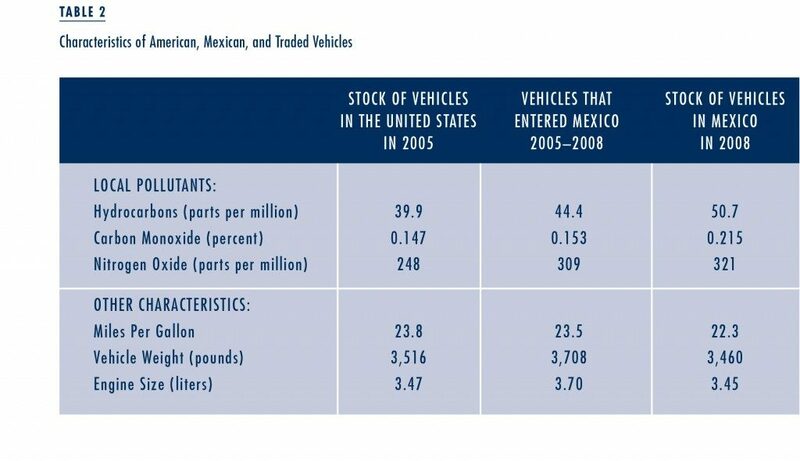 Table 1 shows some characteristics of the vehicles exported from the US to Mexico and compares them to the overall vehicle fleets in the US in 2005 and in Mexico in 2008. The average age of the traded vehicles is 11.4 years. 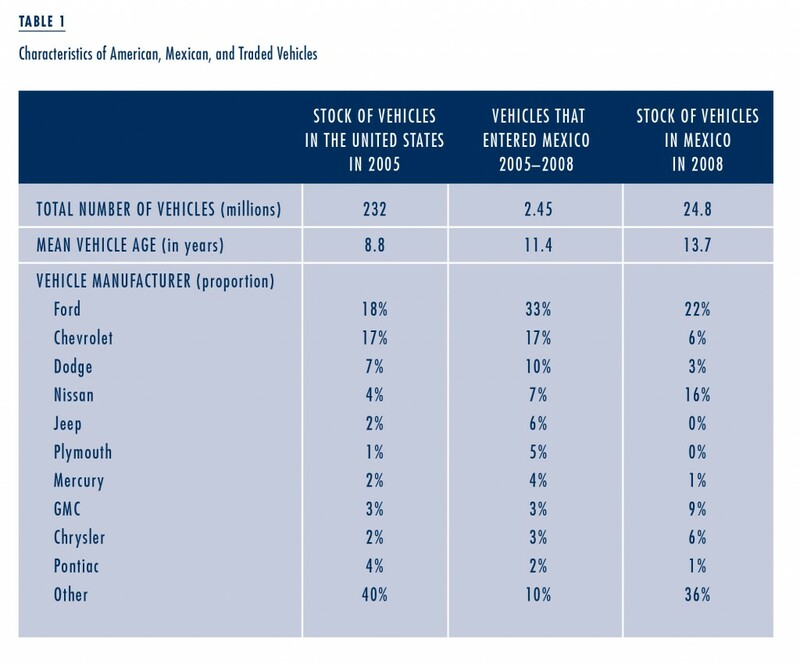 The vehicle stock in the United States is newer and the stock in Mexico is older. Interestingly, whereas 10- to 15-year-old vehicles were eligible for trade, vehicles that were 10, 11, and 12 years old were traded much more often than older vehicles. Only vehicles produced in the United States and Canada were eligible for trade. This is apparent in Table 1, with Ford, Chevrolet, and Dodge representing 60 percent of all traded vehicles, but only 42 percent of the stock in the United States. Do the vehicles sent from the United States to Mexico pollute more than the average vehicle in the United States? We can answer this question using our data from smog-tested vehicles in California. We used the records from the tests of these 7.2 million vehicles to estimate average emissions levels for vehicles of different manufacturers and vintages, and from there we estimate the average emissions of the vehicle fleets in the US and Mexico, and of the vehicles traded between them. Table 2 shows the results, and presents average emission levels for hydrocarbons, carbon monoxide and nitrogen oxide. Compared to the stock of vehicles in the United States, traded vehicles emit higher levels of all three local pollutants. The differences are substantial, ranging from 4 percent for carbon monoxide to 22 percent for nitrogen oxide. Compared to the stock of vehicles in Mexico, however, traded vehicles emit lower levels of all three local pollutants. Again, the differences are substantial, ranging from 4 percent for nitrogen oxide to 34 percent for carbon monoxide. 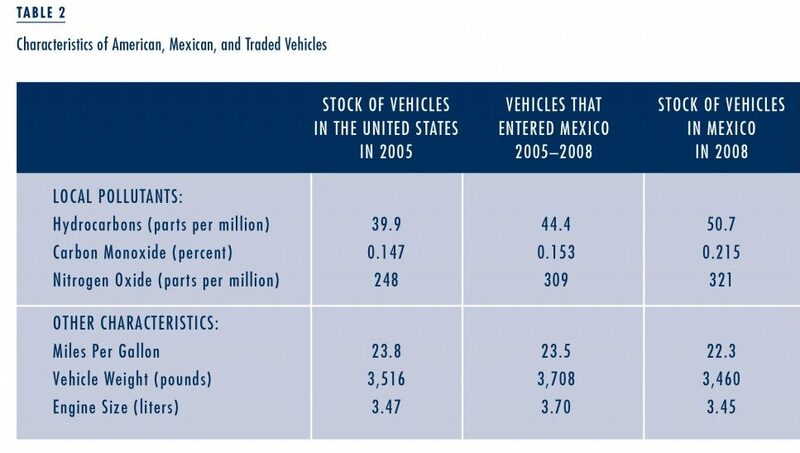 The traded vehicles emit more than the average US vehicle, but less than the average Mexican vehicle. The table also reports results for miles per gallon, vehicle weight, and engine size, all of which directly or indirectly measure vehicle fuel efficiency and, therefore, carbon dioxide emissions. Carbon emissions rise with total gasoline consumption. On average, traded vehicles are heavier and have larger engines than the stock of vehicles in both countries, but the differences are relatively small. Whereas local emissions vary across columns by as much as 20–30 percent, differences in miles per gallon vary by less than 5 percent. 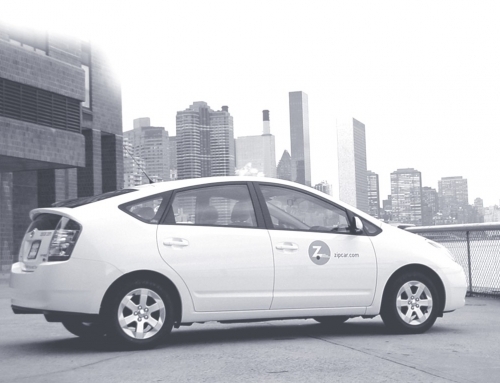 Vehicle ownership and use continue to rise in the developing world. Some of the vehicles driven in the developing world are, and will be, manufactured there as well. The Tata Nano, for instance, is made in India and marketed specifically for poorer Indian drivers. But the developing world also imports used vehicles from the developed world. The United States sends tens of thousands of used vehicles to Mexico each year; Japan exports vehicles to over 100 different countries in Asia, Africa and the Middle East; and South Korea exports vehicles to Vietnam and Russia. Over 80 percent of the vehicle stock in Peru was originally imported as used vehicles from either the United States or Japan. Although these trade patterns have important environmental consequences, they have received little attention from economic researchers. While US households and new vehicle manufacturers would benefit from the domestic cash-for-clunkers programs, households in the developing world—who demand low-quality, cheap vehicles—would be made worse off. The trade in used vehicles can be thought of as an implicit cash-for-clunkers program. If other nations enact their own formal cash-for-clunkers programs, then they may well displace the international trade in used vehicles. While US households and new vehicle manufacturers would benefit from the domestic cash-for-clunkers programs, households in the developing world—who demand low-quality, cheap vehicles—would be made worse off. 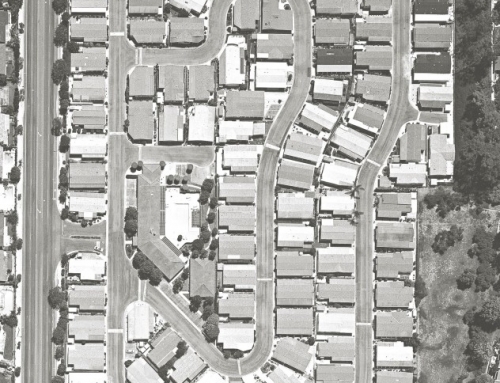 The social and environmental consequences of such incentive programs hinge on several behavioral parameters that our research has begun to examine. Our examination of NAFTA shows that the United States exports relatively high-polluting vehicles to Mexico but that these vehicles are cleaner than the average vehicle currently registered in Mexico. This suggests that trade lowers the average vehicle emissions in both countries. Since Mexico’s total base of registered vehicles is much smaller than the United States, the composition shift is much more quantitatively important for Mexico than it is for the United States. However, whether this trade reduces total emissions, as opposed to average emissions, remains an unresolved question. The answer will depend on how long the imported vehicles are driven, and whether the existing vehicles in poor countries are scrapped as the cleaner imports arrive. As concern about both the local and global effects of vehicle travel grows, measuring the full impacts of the international trade in used vehicles will be increasingly important. Joyce Dargay, Dermot Gately, and Martin Sommer. 2007. 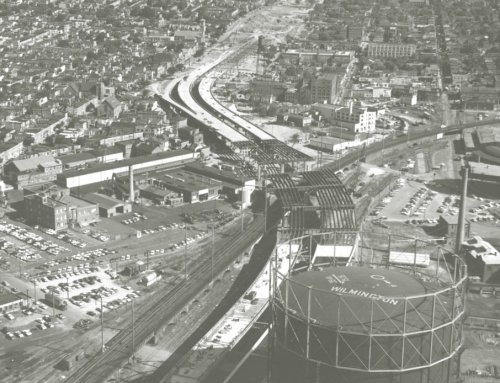 “Vehicle Ownership and Income Growth, Worldwide: 1960-2030,” The Energy Journal, 28 (4): 143–171. Lucas W. Davis and Matthew E. Kahn. 2010. “International Trade in Used Vehicles: The Environmental Consequences of NAFTA,” American Economic Journal: Economic Policy, 2 (4): 58–82. World Bank Mexico Air Quality Management Team. 2002. 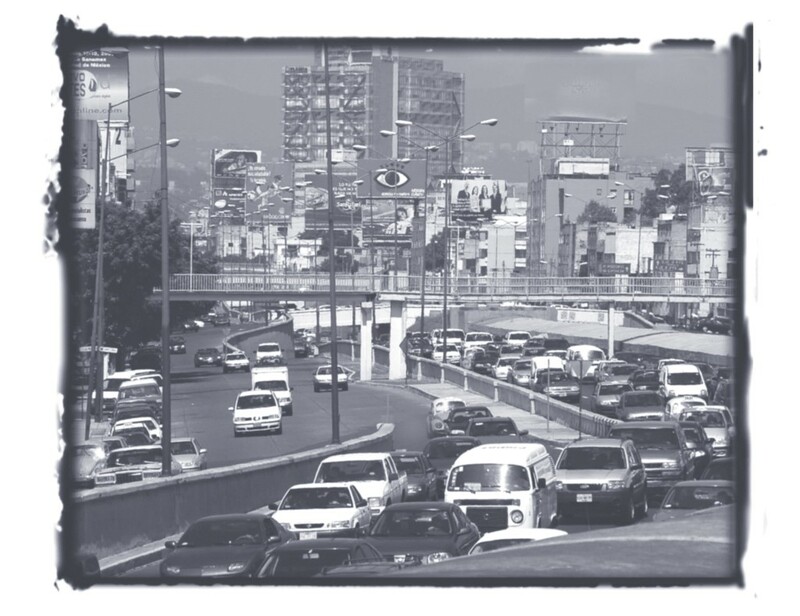 “Improving Air Quality in Metropolitan Mexico City: An Economic Valuation,” Policy Research Working Paper 2785. World Trade Organization. 2007. International Trade Statistics 2007, Geneva: World Trade Publications. Matthew E. Kahn is Professor in the Institute of the Environment and the Departments of Economics and Public Policy at UCLA (mkahn@ioe.ucla.edu). He is also a Research Fellow at the NBER.